Weight bench made with a heavy-duty steel frame, this workout utility ensures solid construction. The sea and back pads of this device is adjustable into different positions -incline, decline, or flat position. You can lift dumbbells and barbells while laying down flat or you can do crunches and curls that target different body parts. It is also useful for switching between various exercises including equipment-free sets. This cutting-edge exercise equipment allows you to sculpt your arms, shoulders, back, chest, abdomen, and legs so that you can get those tight and toned muscles that you've always wanted. The weight bench has a comfortable foam roller pads with high density upholstery that allows comfortable strength training. Exercise your torso while lying down on the back and seat pads or train your upper and lower limbs with the device's arm curl facts and leg developer. By maximizing the weight bench's great features, you'll be able to develop a well-balanced physique which not only improves your appearance, but also your overall health. Strong multifunctional rack & bench set for barbell and dumbbell, curl weight workout and sit up bench. Multifunctional machine stretching, abs and leg work out. 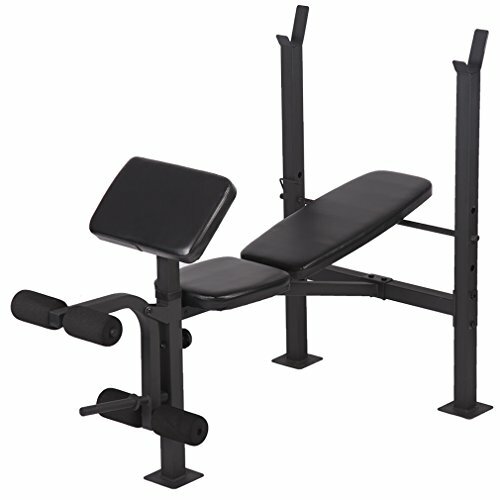 Adjustable flat & incline bench for various level of strength. Freestanding decline bench offers wide variety of core workouts. Heavy Duty Construction:Made of durable steel frame,this equipment guarantees solid construction.The structure's stability and its ergonomic design ensures that the bench's structure won't collapse under your weight ensuring the best workout possible. Adjustable Back Pad:The weight Bench has a multi-position back pad that can be altered to suit your workout routine. It features independent, adjustable-height crutches to help you find your ideal position. Perform many different training exercises with the bench's various configurations, such as chest, decline, military, and incline lifting positions. Multi-Functional Leg Training:This bench has a dual-action leg developer to boost your lower body. It also comes with padded foam rollers for maximum comfort on your ankles and knees. Comfortable And SoftPads:This device has comfortable foam roller pads to provide comfort leg extension workouts. It has a high-density upholstery for an enjoyable strength training experience, so you can workout while minimizing fatigue and physical exertion. Enhanced Safety:With built-in safety hooks and No-pinch design to prevent injury to hand and grip.